How to manage the tree’s structural and biological needs. How to assess project longevity and load capacity. How to design in safe, natural, sustainable, and attractive ways. How to use good judgement to honestly tell you when the risks are just too high to undertake the tree house project as planned. It’s better to know that now than after you have invested significant time and money into the treehouse, right? Don’t assume that everyone has enough knowledge, experience, and good judgement. We are called in to fix bad work or take over unfinished treehouses or ziplines several times each year. We suggest that you do your research before hiring a consultant for your tree house. If we’re too far away and you want a local referral or a business recommendation, please just ask us and we’ll be glad to help. 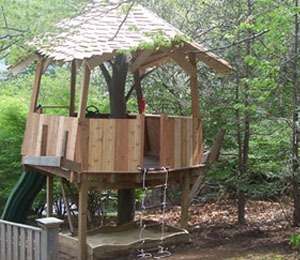 There are some great tree house builders that we recommend without reservation. Alternatively, we offer long distance tree house consulting services. We’re just really concerned about a few tree house builders out there who are building unsafe projects – so choose carefully for your own safety and the health of your trees. How many years of full time tree house building experience do they have? Beware that some builders claim decades of experience but spend most of their time pruning trees or remodeling houses, while building only a few tree houses each year on the side. Relevant experience is important because sometimes it can take 5-15 years before a poorly built tree house kills a tree or falls down. We have seen floors fall out of tree houses, with parts of the walls still up in the tree. We have seen trees completely strangled by tree house beams bolted directly into the trunk. We have seen tree houses sagging under their own dead weight; an indication that failure of the tree house fasteners has already occurred, a safety factor never existed, and disaster is imminent. Many kinds of root damage aren’t readily visible to the untrained eye for about 7 years. So in our book, a treehouse builder with only a few years of experience is not trustworthy. How much weight will my treehouse hold? How much does the structure itself weigh (dead load)? How much of that support is left for live load (people) and shifting that happens as the wind blows? How much of a safety factor is built into the design? These questions will not be answerable with precision without paying significantly extra for tree house engineering work. However, if the tree house professional can not give you reasonable estimates, then the chances are that they have never given significant thought to those issues and are not qualified to design for safety. How do they handle mistakes made while designing or building tree houses, and how have they resolved each situation and learned from the mistakes? If the tree house professional is being honest with you, then they will admit that tree house construction is both a science and an art form, and that they aren’t perfect. You want to hire an expert who learns from mistakes, is honest with you, and does whatever is possible to make a bad situation as good as possible. Do they have the respect of their peers? This is critical. Some 30% or so of our tree house clients ask for past client references, and we cheerfully give them a list of 2-3 clients we have designed and built tree houses for within the past 12 months. However, it is a rather easy task for any contractor, even a bad one, to cherry pick a few of their happiest clients. One contractor we know listed his girlfriend as a reference, and you might never know if you spoke with that person. Why not call a treehouse builder on the other side of the country and ask that builder for their opinion? The treehouse construction industry is relatively small, and many of us know and have working relationships with each other. We know which other tree house building companies we trust. If a company has the respect of its closest competitors, then there is a great chance that you have found a good tree house construction company to help you! We are happy to give references if you are considering hiring one of our competitors. Still have questions? Contact Tree Top Builders for more information.